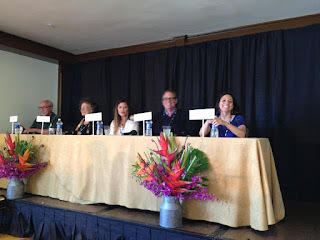 I attended the Santa Barbara Writers Conference last week. This conference doesn't mess around. It is six days of intensive work. There's something brilliant in the way it's been architected. It's been designed so that the more you put into it, the more you'll get out of it. While there, I learned from the guest speakers. Dorothy Allison's speech infused me with fire. Gar Anthony Haywood's honest and raw words put reality back into the equation. The road to success is long and often elusive. And Fannie Flag reminded me why I love to read. On Monday, I met with agents. The plan was to get their take on my novel, and its marketability. What I didn't count on was the interest I received. Now I have my work cut out for me. But that's why I play this game I love. When it's a labor of love, there is no such thing as too much work. But the thrust of the conference was dedicated to the craft of writing. Each workshop dedicated to read-and-critique. If you haven't done this before, the basic approach is this: you read 2-5 pages of your work, and others in the workshop make fun of you give you valuable feedback. Truth be told, the workshop leaders and the attendees were brilliant. Spot on and helpful. I was suspicious at first, unsure what to expect. Instead I walked away with dozens of pages of notes. But when I listened to other people, and dedicated myself to helping another, that's when magic happened. Have you ever tried to help another by teaching them something, or coaching them? Then you know the power that is generated in those conversations. You get better in the process. You'd think that would just about cover it. It was in the agenda, after all. We'd get to work on our material, we'd listen to brilliant writers, and we'd get to meet with agents. Could there be more? The most important thing I got was the expansion of my tribe of writers. Each time I spoke to another writer, my world expanded. Each conversation brought us closer. And each toast we drank, solidified our bond. 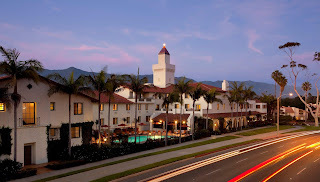 At the Santa Barbara Writers Conference my tribe grew. I met some phenomenal people -- too many to mention, but some that I hope will be part of my writing journey for decades to come. Believe me that their success will be mine. We writers, we're all the same. We live with doubt and hope. Both ever present and powerful. But when we are with our kind, our tribe, we know that we can accomplish anything. All we need is a pen and paper (or iPad for that matter). We are writers. Time for desert. When you have time, watch this video. Fair warning: she's a badass! Great post! Yes, it is difficult to put the whole experience of the SBWC into words, but I think you did a terrific job! Enjoyed reading it - brought back good memories. Hi Brandy. Thank you for your nice comment. I'm glad you were the first person I met there! You helped me swerve toward the better-aligned workshop leaders. And there were a lot of workshops there! Looking forward to reading your blogs. Take care.